In this first part we explore what it means to be a director of photography, collaborations, formats, framing and movement through quotes from cinematographers Paul Cameron, Darius Khondji, Dariusz Wolski, Douglas Slocombe, Harris Savides, Jan DeBont, Janusz Kaminski, Jeffrey Kimball, John Shwartzman, John Toll and Stephen H. Burum. In the 2nd part we concentrate on lighting (and smoke). In the 3rd and final part we explore lenses, filters, colors and film vs digital. “A cinematographer is a visual psychiatrist – moving an audience through a movie … making them think the way you want them to think, painting pictures in the dark.” Gordon Willis, ASC. No matter how many times people have said this, I’m going to say it again: The most important thing is preproduction – to chose the right locations, to chose the right time of day, and to let everybody in every department know what you need to do to make the movie work. At the start of a movie you have to make your set of rules as to how the film looks and how you are going to shoot it. In about two weeks you start freaking out because everything looks the same, or you get bored with it. You have to stick with that and stick with your convictions and just keep going. The Director o Photography and the Director become the police, the protectors of the look of the film. You have to keep that going for 13-14-15 weeks and you can’t let these little voices change what you are going to do. The film has to have it’s integrity and has to have its visual voice. There are many different ways to prep for a movie. The most important thing is to try to stay in touch with the first emotion I had when I read the script. As I continue along in the film making process, the days become more about logistics, costs and actors schedules, which isn’t perfect for the DP. That’s why it’s important to remember the things that were there when we first read the scripts, before the problems. No matter how much prep time you have, you’re ultimately going to photograph the film in an unknown way. Every film poses its own problems and you have to think and experiment to find a solution. A lot of cinematographers will talk about Vermeer or Caravaggio as influences. I tend to be more inspired by pictures with less obvious lighting themes. One of my ‘bibles’ is Robert Frank’s “The Americans” I take it with me whenever I travel. Instead of shooting everything and looking at it later, please make a decision. It’s hard to make movies. We don’t have money, and we have to act like the police are chasing us. So let’s try to do this with some dignity and do it well, and have some fun and do good work. As a cinematographer you have to respect elements like De Niro’s use of body language and gesture, and use those elements in framing shots. If you don’t do that, you’re cheating the actor and you’re cheating the audience. 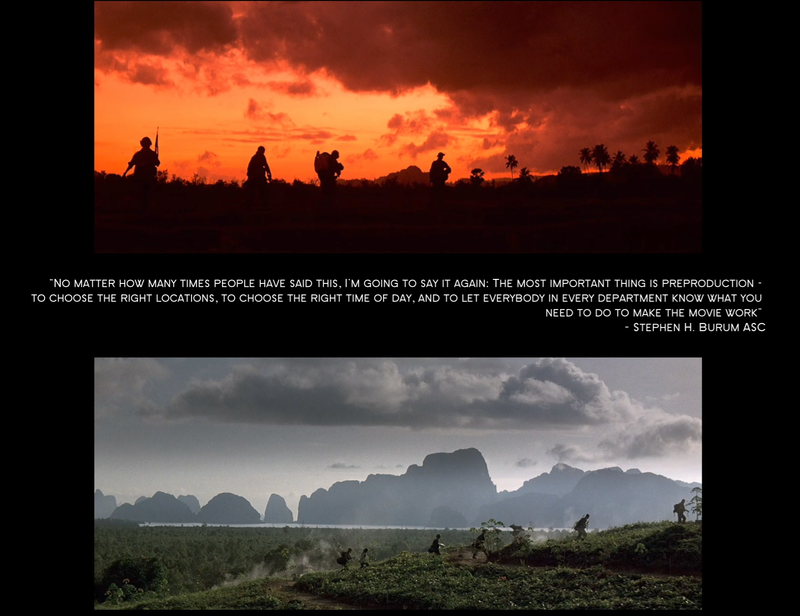 As a cinematographer, you have to recognize what the dramatic values are in order to show them. For me, format is primary, and the second most important thing is the glass, the optics. One of the things I try to do when I’m working in the anamorphic format is let everything leak out of the sides of the frame. If there’s a two-shot, for example, I let the age of the frame cut into the actors’ shoulder. It make you feel as though the image goes on forever. I really like handheld and not necessarily in a chase. Even in straight dramatic scenes just with two people talking. It gives you really intensity, just by looking a little rough. We designed the sequence to combine wide shots with close shots, and gliding steadicam shots with brutal shots – not steadicam, just the operator running with the camera. I held a second camera myself and I occasionally would literally throw myself on the floor with the camera. So we were mixing steadicam shots with locked-off shots and dolly moves, this constant melange helps give the scene its rhythm. In the 2nd part we concentrate on lighting (and smoke). “A cinematographer is a visual psychiatrist – moving an audience through a movie … making them think the way you want them to think, painting pictures in the dark.” Gordon Willis, ASC.